Ratio competed in the TU/e contest. In this contest, young innovators had the opportunity to get in touch with relevant and up-to-date business partners, consultants and financiers. This led to interesting conversations and more sight on the opportunities that are created especially for start-ups (for example, subsidies, etc.). Consultants of De Breed en Partners were also present and shared their knowledge and insights on their specialisms: innovation and technology. Next to this De Breed en Partners acknowledged the added value of Ratio’s technology and stated; “Ratio’s technology is an innovative solution that will have a major impact on the engineering world and industry, this is technical excellence and a rightful winner of the TU/e contest”. 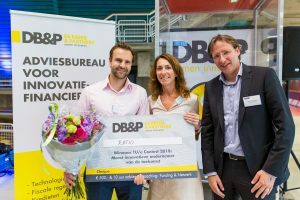 It did not end with nice words, Ratio was awarded a prize of €500,- and 10 hours of consultancy by De Breed en Partners. Both of these gifts are highly appreciated, next to this it was an energizing experience to have a conversation with the experts of this company.